On Wednesday morning, April 4th, we set out to explore the area. We had done our usual search for a breakfast restaurant and found Kora’s Place which advertised the “best cooking in the South and Yankees say the North too”. Sounded promising so we set the route in Google maps and off we went. Well, apparently Google Maps had no idea where this place was since we ended up on a residential side street with no restaurant in sight. Using our car GPS, Mrs. Garmin, we entered the address and it ended up sending us a mile down the street to the right place which was tucked behind a few buildings . Even though it was only 9:30 a.m., there were no cars in the parking lot. Hmmm, that wasn’t a good sign but we decided to go in anyway. Yep, not a soul in the place! Since it didn’t look too bad, we picked out a table and sat down. A minute or so later, a woman wearing an apron (guess she was the waitress, cook and whatever else) shuffled over to our table, barely mumbling hello. Oh no, did we lose that wonderful Alabama hospitality already by heading north? By this time we had looked at the menu on the table which had no prices! Yes, you read it right, there were no prices on the menu, and in our neck of the woods this usually means if you have to ask you can’t afford it! Since we didn’t want to pay the price of the day for a couple of eggs, we asked her if she had a menu with prices on it – she looked slightly bewildered that we would even be asking and mumbled something to the effect that she had a menu with prices at the register that we could look at. Now maybe this is standard procedure for a small town restaurant and we had just never experienced it before, but we just found it odd and coupled with the other oddities and the general uneasy feeling we had about the place, we quickly told her we had changed our minds and left (this induced an even more bewildered look). As we got into the car, we both started giggling, exclaiming “boy, that was really weird”! 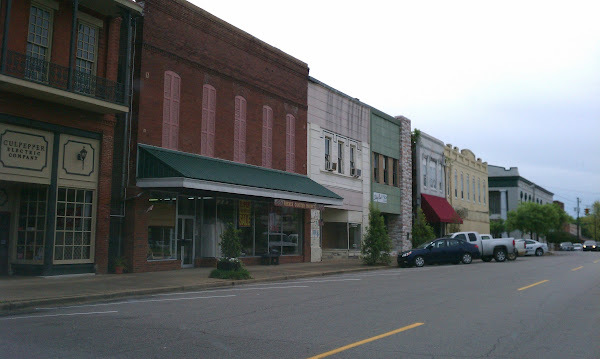 So if you ever go to the little town of Demopolis, and stop at Kora’s we’d like to know how you make out! While we were looking for Kora’s, we had passed another restaurant, The Farmhouse, so we ended up going there. Different experience completely – as we walked in we were greeted by a very friendly waitress with the typical ‘hi y’all, how ya doin’ today?” The food here was good and reasonably priced (caution, the hotcakes are huge). I guess we were still in a state of shock from our first experience so we forgot to take any pictures! Oh well! After breakfast, we set off to do some exploring of the area. 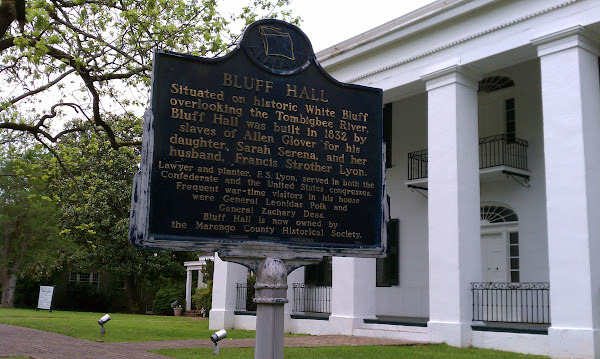 Bluff Hall, which overlooks the Tombigbee River, is one of the antebellum homes found close to the historic downtown and exemplifies two major architectural trends in the Antebellum South. 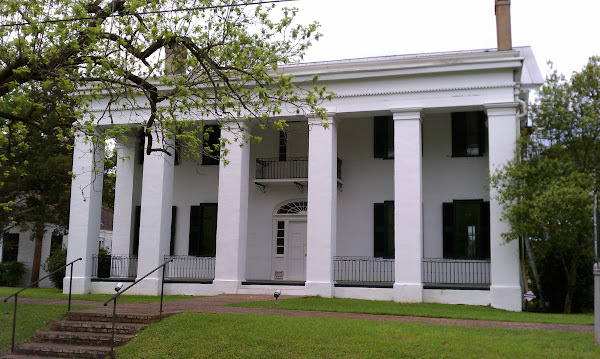 Built in 1832 as a father’s gift to his daughter, the original brick Federal style structure was modified to Greek Revival in the 1850′s by the addition of the columned portico, a large rear wing and white paint. We did not go into the home but did take a few pictures. 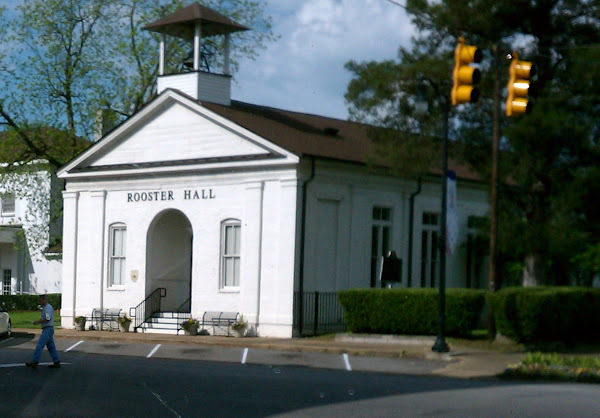 Rooster Hall in the downtown historic district was built in 1843 to serve as the Presbyterian Church which it did until then end of the Civil War. 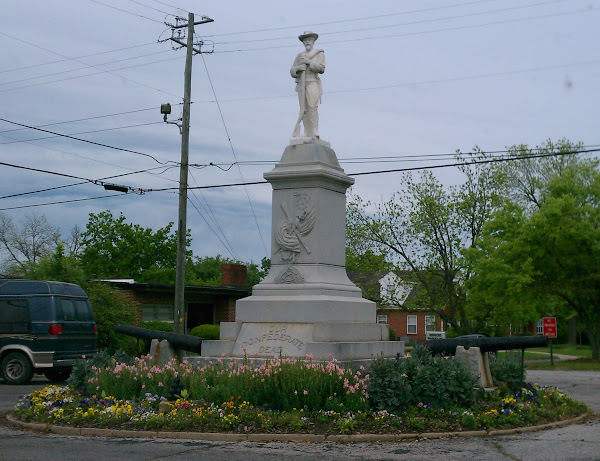 At that time it was confiscated by federal troops as their headquarters and became the Marengo County Courthouse through the Reconstruction. 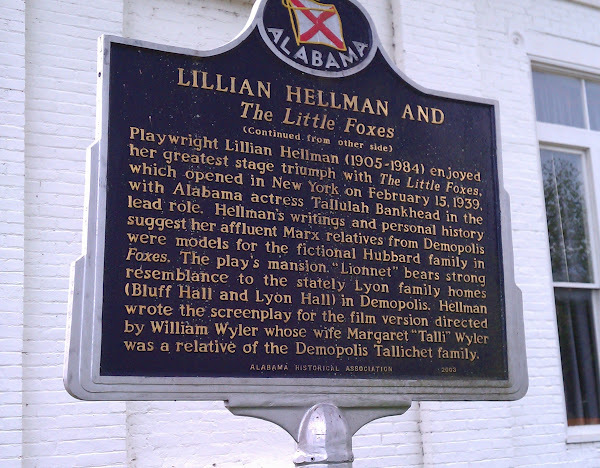 In 1876 the city leased the building to the Demopolis Opera Association who rehabilitated the building for live performances and public speaking events. Until 1902, the Opera House featured mostly local talent but also featured talents from New York and New Orleans for special performances. There are several other historic houses in the area (Gaineswood, Lyon Hall, Laird Cottage) but we didn’t have time drive by each of them, maybe next time. 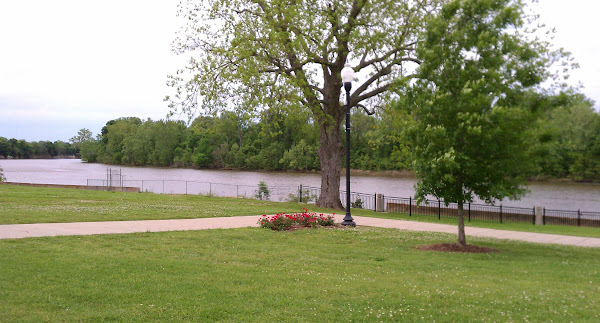 We did go to the City Landing which is a park right on the river and is very nice. 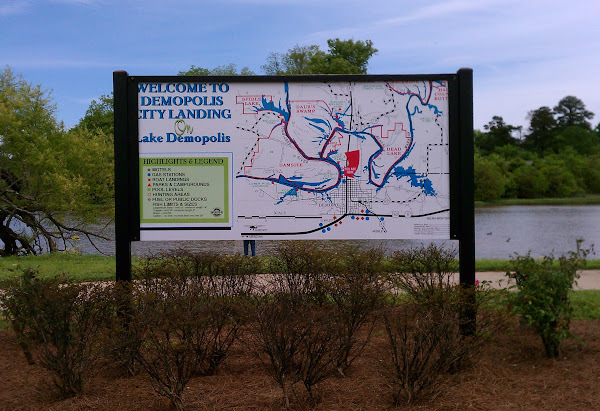 Then we drove over to the Demopolis Yacht Basin which has dockage and covered dock slips as well as dry storage facilities. 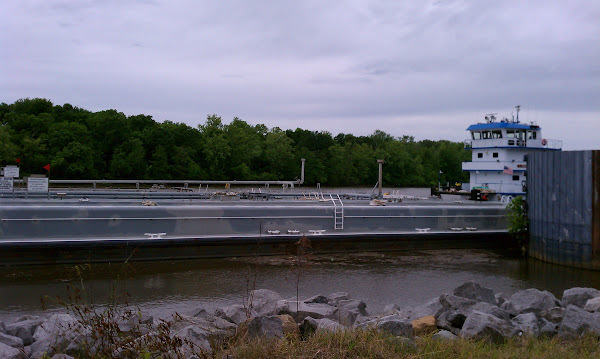 From here, we watched several tugs pushing huge barges down (or maybe up) the river. There’s also the usual retail strip with grocery stores, fast food joints and a variety of other stores including a Walmart. After touring around town, we returned back to our hacienda at Foscue and took a bike ride around the campground. That night we had a campfire in the park provided firepit. I’ve never heard of this little town so will have to check it out someday. As far as Kora’s sounds like y’all were in the twilight zone. Welcome back to reality.